How to outsmart Sekiro's boss puzzle. 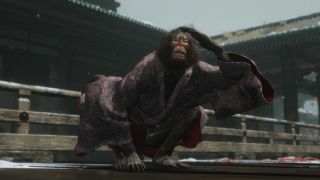 You'll encounter the Folding Screen Monkeys boss as part of the story when playing Sekiro: Shadows Die Twice. You'll need to have defeated Genichiro Ashina and spoken to the Divine Heir to access this boss; from the Senpou Temple—Main Hall Idol, interact with the altar here to be teleported to the boss arena. This fight has four monkeys that you'll need to defeat; you can speak to the Illusory Hall Monk to find out the characteristics of each one. They are non-aggressive and it's your job to hunt them down and take them out but of course, it's not that simple. Illusionary Monkeys will spawn to attack you and while these do minimal damage, they will build up your terror significantly if they hit you so it's best to take them out quickly if you come across any. It's worth noting that you can - and should - use the Illusory Bell to reset the area after you've killed each of the four monkeys; this will reset them (and you) to their starting positions. Don't worry, you won't lose progress on the monkeys already killed. As soon as you spawn into the boss area, take a couple of steps forward before turning around to attack the area that you were just stood. One of the Invisible Monkey's spawn points is here so if you're lucky, you'll be able to make short work of him. He's also been reported to spawn in the watery room to the left (with the note on the wall). Once you've taken care of him, ring the Illusive Hall Bell to reset. This monkey is located in the tree in the centre of the area. You'll want to make your way around to the left to the water-filled room, then right and into the second structure on the left. Now turn right once more to head down a hallway and ring the large bell you find here. Quickly grapple to the tree in the centre of the area and take out the Green Monkey. Use the Illusive Hall Bell once he's dead. Run left towards the water-filled room and then right, up the stairs to another building. Turn left into a room with statues and a note on the wall on the far side. Open the door next to the note then search for a grapple point in the roof above you. Grapple to it then onto the roof of the second building in front of you. Kill the Purple Monkey on this roof then ring the Illusive Hall Bell once more. Immediately take cover behind one of the folding screens in front of you to hide from the Orange Monkey that's located on the roof directly ahead of you. Once the icon above his head disappears, sprint forward and grapple to the roof where the last monkey is. If you're quick, you'll kill him before he has the chance to move.